This comprehensive volume presents data describing the role of oxidative stress in anterior eye disease. The content is divided into three logical parts: basic science of the cornea, basic science of the lens, and clinical practices. The first two parts include eighteen chapters that discuss topics ranging from oxidative stress and dry eye disease, endogenous protection of corneal cells against oxidative damage, the therapeutic potential of corneal stem cells, etiology of cataracts and preventive measures, corneal degeneration through oxidative stress and cataract formation, and function and dysregulation of ion channels and transporters in the ocular lens, among others. The concluding part is comprised of four chapters devoted to advancements in corneal surgery, cataract and diabetic retinopathy, the clinical treatment of cataracts including traumatic cataracts, and cataracts in the pediatric age group. 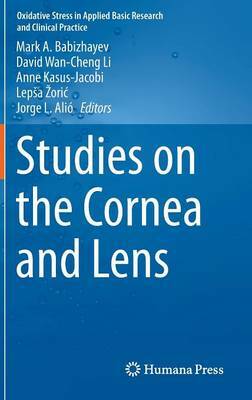 Studies on the Cornea and Lens is an essential addition to the library or department of physicians and researchers who treat or research these ocular conditions, particularly cataracts. It is also a key resource for cell biologists studying oxidative stress. This book is an authoritative contribution to Springer's Oxidative Stress in Applied Basic Research and Clinical Practice series.